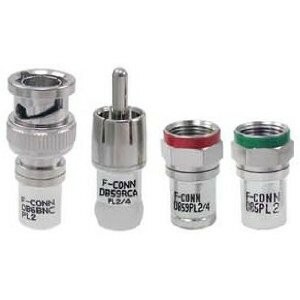 Double Bubble™ Plenum and Security (CCTV) Compression Connectors are available in F, RCA and BNC for a variety of RG59 and RG6 cable sizes. Specially engineered plenum connectors make installations easier. The Security (SL) connectors are designed for RG59 CCTV coaxial cables with copper braiding and a solid copper center conductor in RCA and BNC.